Their story would make one heck of a country song. bus, she vows to win her best friend Deacon’s heart. Former bad boy and current fiddle player Deacon Latrell has the world at his fingertips: a new gig with a famous band, plus his best friend on tour as his son’s nanny. With one friend set on pushing the boundaries and the other afraid to rock the boat, one thing’s for certain—their story would make one heck of a country song. As you’ve probably figured out by now, this book is about two friends trying to deal with their attraction for one another, in different ways: one tries to get the other’s attention, where the other tries not to put their friendship in danger. The question is how do you cross the “Friend Zone” without destroying it? I found the story quite enjoyable, especially because it covers with sensitive aspect of becoming more than friends. There may be more things I was not quite comfortable with, but at the end of the book, I felt satisfied enough with giving three stars. Hannah is a nice character. She’s determined to make Deacon see her as more than his best friend, after a year away from him. Being away from her loved ones made her become more confident and become mature enough to follow her goals. Throughout her childhood, she found comfort in Deacon, him being the only kid her age interested in becoming her friend. Because of her stutter and her cheap clothes, she has always been regarded as an outsider. With a significant number of people that had abandoned him, Deacon appreciated the little girl’s gesture of talking to him that day and ever since he’s done and nothing but protect her. She’s given him the family he’s never had. Her parents welcomed him and provided support when his drunk mother was not able. He has a great career ahead only because of his best friend. She pushed him towards his dreams, so he wants to fight this insane attraction at all costs, or else it will destroy their friendship, his heart and especially his little boys heart. His son regarded Hannah as the mother she never had the chance to meet. I like this fight that torments each character and I like more that they were pushing for completely different things. But I was not at all comfortable with all the talk and no action from Hannah’s side. She is portrayed as such a determined person, willing to do a lot to gain Deacon’s heart. But only when pushed by her new friends does she act on her plan. And I also was a little confused at what Deacon’s feelings were. We also find out things about his ex-girlfriend, with whom he appeared to be in love at some point. She is described to be such a mean person and criticized that at some point you get to hate her completely, even though she’s not a character in the book. I still have mixed feelings about the story, but at least now I can say I enjoyed it. I expect more from the other books in the series. An admitted bookaholic and homeschool mom, she gets through each day by laughing at herself, hugging her kids, and watching way too much Food Network with her husband. 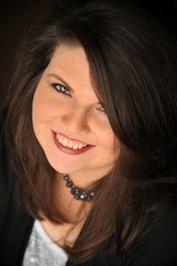 She writes young adult, new adult, and adult romances, and LOVES talking with readers! Thank you for reviewing today!